With my arm back in order, and a camping trip for my girlfriends birthday at Lewey Lake on tap, the stars seemed aligned to get my summer back on track. 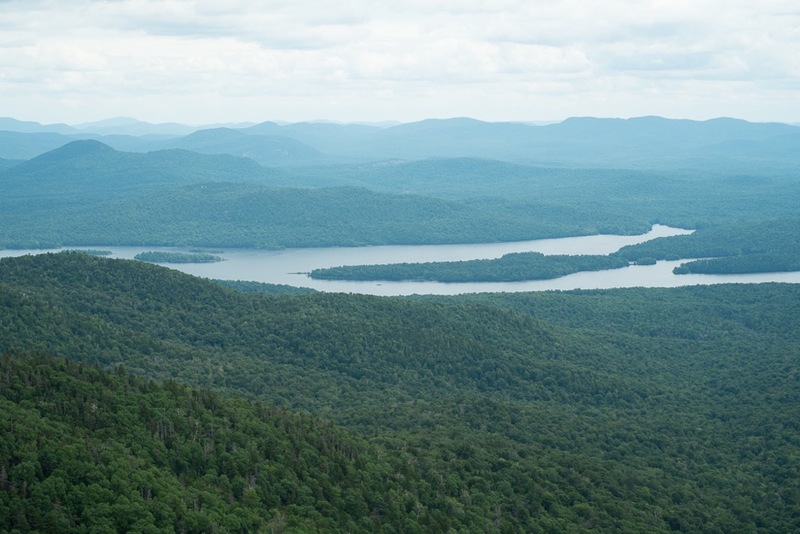 Although Lewey is practically in Gore’s backyard, I haven’t spent much time in this part of the Adirondacks. The drive on endless two-lane blacktop serves to remind you that the park really is huge, despite the fact that we made good time getting there from NYC. The campground was groomed to perfection, clearly a different summer meaning but I’ll take it. With ample space between us and our neighbors and perfectly clean sites we felt pretty spoiled. But we weren’t there just to celebrate. 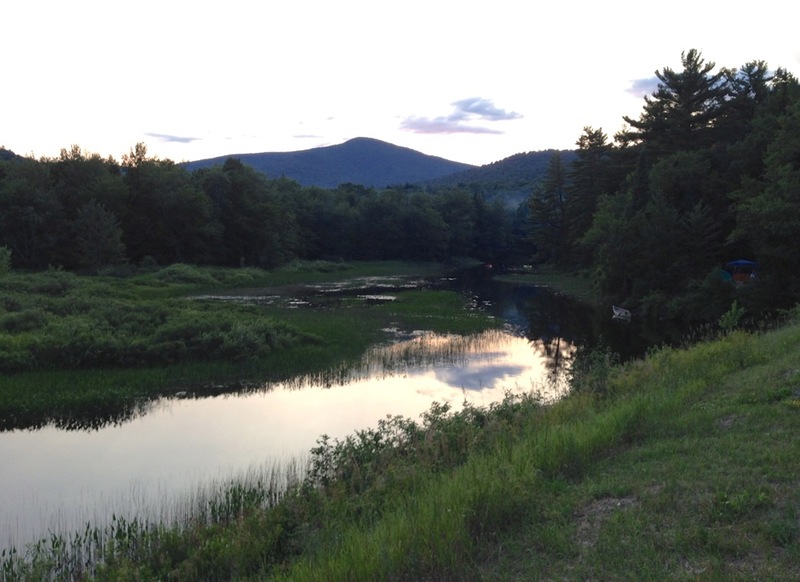 I had a second pack ready for a climbing expedition to the massive ledge near the top of Snowy — the largest peak in the southern Adirondacks — just a five-minute drive away. My friend Nick and I had long talked about getting in a bold outdoor climb, ever since taking our “Learn to Lead” class at the gym over the winter. 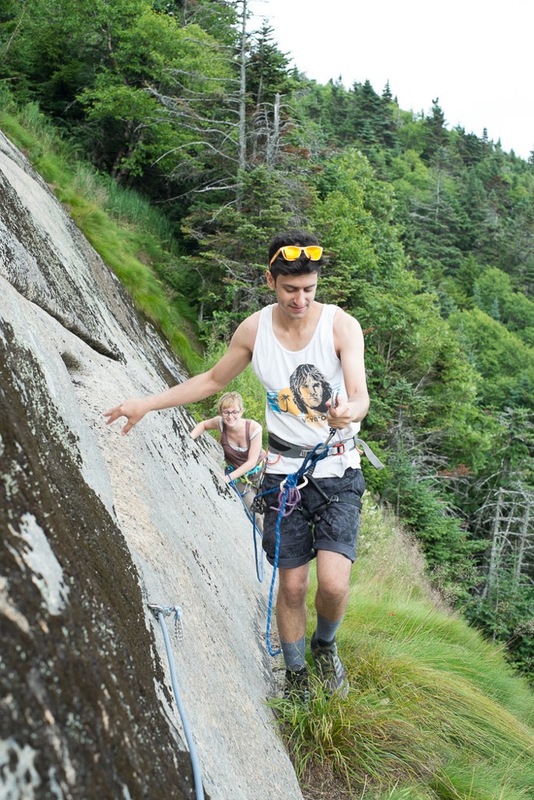 In typical Adirondack fashion, getting to the ledges was more effort than we anticipated. The trailhead sign marked 3.5 miles to the summit had to have been closer to 4, and we still had to find the goatpath to the cliff base. Making matters more interesting, my pregnant friend Julie was with us, which meant that before long we were carrying her pack too. That’s what friends are for, according to the song and Julie. The view from the ledge was astounding. You couldn’t ask for anything more, it felt like a real mountaineering experience to be near the top of a mountain instead of on some flat ground under the cover of trees at the local crag. There were even ropes to help you along the 12-inch footpath at the edge of the cliff, so you could get to the belay spots. Julie took one look and told me that I wasn’t going to kill her unborn child. If we wanted to climb we had to climb the first route, Vertabrae, rather than find the easier stuff towards the other end. 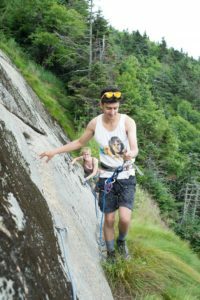 The picture in the ADK Rock guidebook featured Cloudsplitter Guide Emilie Drinkwater heading up like a pro, and I thought… maybe we had a chance. Picnic lunch was put out, and we relaxed before racking up. The bresaola sandwiches calmed Julie down a bit, although we still had her tethered in to the cliff the whole session. It was time to climb. I kicked off the lead pretty well, cheating far to the left to get around a mossy bit at the bottom. Just past the moss there were tons of fresh Blueberries. I thought it was a good sign. But my lack of slab experience quickly proved to be a detriment. I can only describe the experience as uphill yoga, i.e. impossible. With no holds and no feet, we took turns cinching up a couple bolts at a time, but our late start had us concerned about getting down with our nervous and pregnant partner. Getting back to the trail was far faster than finding the ledge, so I convinced my friends we had time to gain the summit. 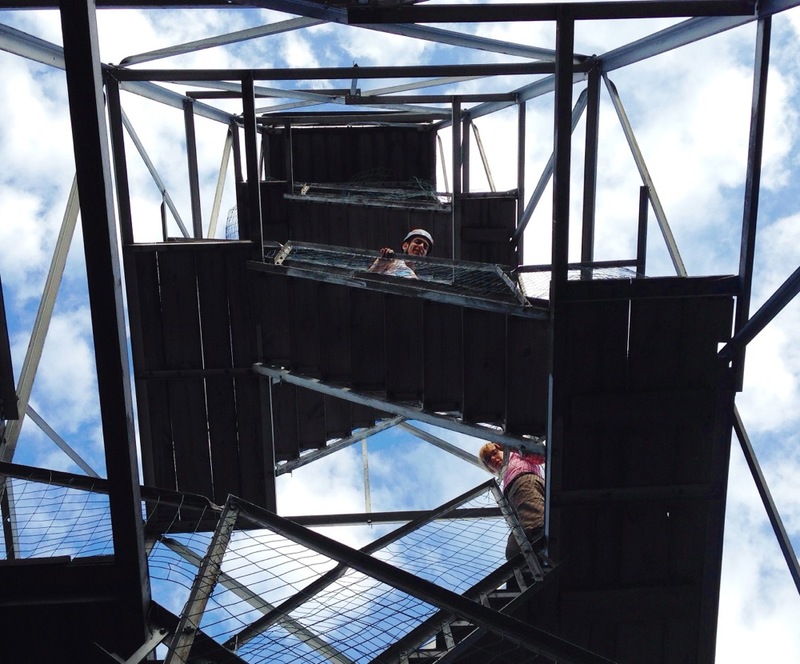 A five minute hike up put us on the most incredible patch of wild grass I’ve ever seen on top of a hill, and a few minutes after that we found the firetower that put all of the previous views to shame. Snowy’s larger cousins to the north called out over the immense plain that separates the northern and southern Adirondacks. 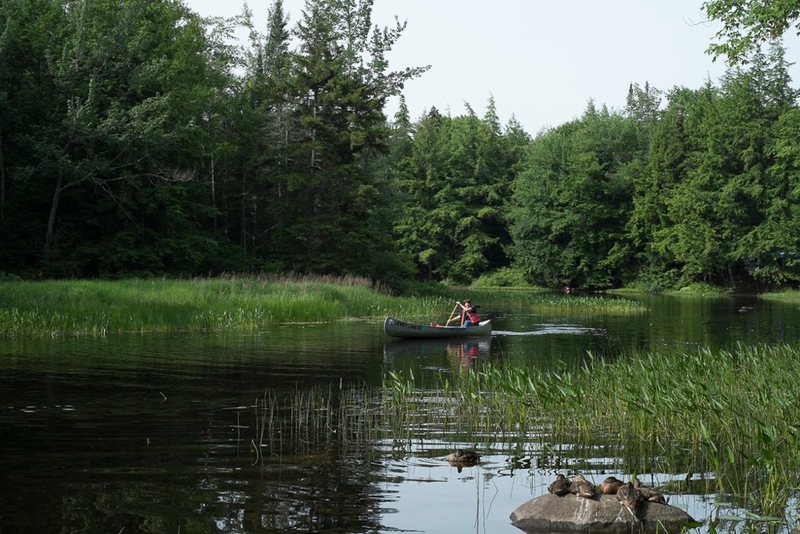 At midnight, we took a canoe out and floated around under the dizzying night sky at Lewey. I can’t say that the stars were aligned, but they were the brightest I’ve seen. There’s no way any climb could be as sweet as the memory as hanging out with my friends on the lake, but I have the new Adirondack Rock book on the way just in case. Hopefully there’ll still be fresh blueberries, too. Nice TR ML! I hope we can climb together sometime soon! So I’ve always wondered given that Snowy is the highest peak in the southern Adirondacks and that is located west of Gore where they get more lake effect and the name “Snowy Mountain” would it have been a good place for a ski area? Greg – That’d be fun! Mark – we’ll never know now but it sure is a nice summer spot. Not sure why Snowy wasn’t considered for a ski area as it would have made a beautiful ski area. Maybe it was privately owned at the time. The story I’ve heard was that both Gore and Hoffman Mountains were considered and in two winter of measurement Gore got more snow.